Every human brain has essential proteins, called tau, that perform vital functions in a healthy central nervous system. But scientists have discovered that people suffering from Alzheimer’s disease and similar disorders have clusters of tau proteins in their brains that aren’t operating properly. When clustered abnormally, they fail to perform vital tasks such as cellular organization and the transporting of nutrients, and the cells eventually die. This summer, associate professor of chemistry Zach Donhauser and two Vassar students are conducting research on tau proteins that may help answer two questions: Why do tau proteins form clusters in diseased tissue and what are the molecular changes that cause these proteins to stop functioning properly? “At this point, we don’t know whether it’s the aggregation of these tau proteins that causes Alzheimer’s and other neurodegenerative diseases or whether the disease results in tau aggregation,” Donhauser says. Working under the auspices of Vassar’s Undergraduate Research Summer Institute (URSI), Amizhdini Eswaramoorthy ’17 and Zofia Siwicka ’18 are helping Donhauser gain more insight into how and why these tau proteins act the way they do. Using an atomic force microscope (AFM), they are observing what happens when they press some of these proteins against each other. The AFM measures the strength of the attraction, or repulsion, between the healthy or unhealthy proteins as they are brought together. Both students say they knew virtually nothing about tau proteins, or the equipment they’d be using to study them, before the summer began. 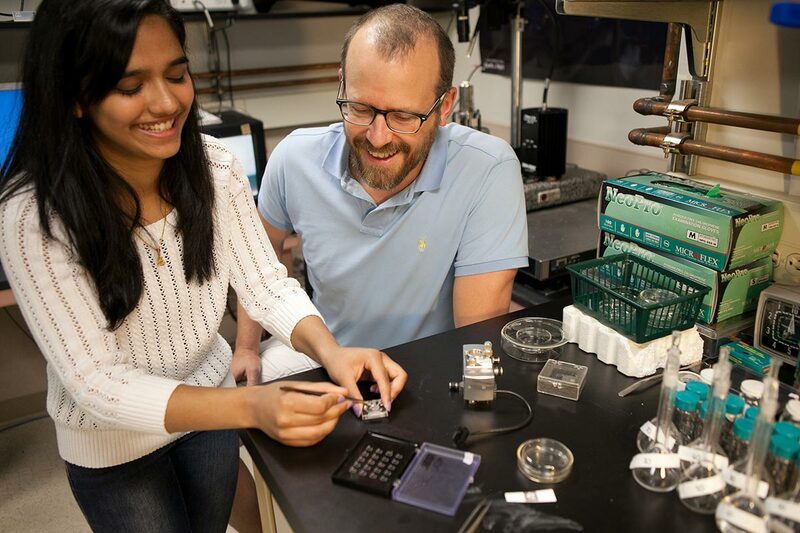 “It was a big learning curve for me – I didn’t know anything about the subject matter or the lab equipment or procedures before we began,” Eswaramoorthy says. A biochemistry major from Miller Place, NY, Eswaramoorthy says she’s chose this URSI project because it aligned perfectly with her academic interests. “I plan to go to medical school, so I’m interested in understanding the function of the human body,” she says. She is concentrating her research on a certain portion of the tau protein, with the goal of understanding which regions of the molecule are responsible for the attractive forces between proteins. Siwicka is studying a mutant tau that models a disease-state protein. One of her principal tasks is measuring the forces that occur when this mutant interacts with other tau proteins. She says she applied to the URSI program to learn more about what she hopes will become a lifelong profession in the laboratory. “I plan to do scientific research after I graduate from Vassar, so this project is giving me real-life experience,” she says. “This is very high-tech stuff, much more advanced than the things we do in normal classes during the year. Using the AFM and preparing samples, that was all new to me.